Internet has changed the we avail various government services in India. Although, we are not fully there, mobile and internet has enabled millions of Indians living in hinterland of India to be part of this revolution. Now, Ministry of External Affairs has announced that they will soon be launching Passport related services through the vast network of over one lakh Common Services Centers (CSCs) across rural hinterland. In 2006, Government had approved setting up over 1 lakh internet enabled centers in rural areas under the National e-Governance Plan (NeGP). 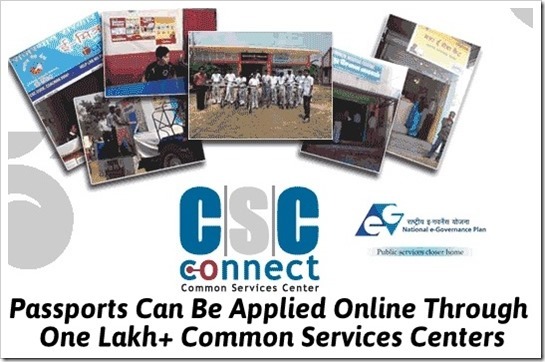 These centers called CSCs or Common Services Centers typically act as delivery points for Government, Private and Social Sector services in the areas of agriculture, health, education, banking, insurance, pension, utility bill payments, entertainment, etc. to rural Indians at their doorstep. Now, Passport Seva services are being added as part of their bouquet of services offered by CSCs. Indian Citizens can approach their nearest CSC and avail passport seva services like applying for passport by filling up entire application online, including payment of fees and scheduling of appointment for seeking any Passport related services. Personnel at the centers would facilitate filling and uploading of Passport application form, payment of applicable fee (through debit/credit card or through SBI internet banking/challan mode) and scheduling of appointment for the visit to the Passport Seva Kendra (PSK). These services will be at nominal charge of not more than Rs. 100 and will be available throughout the week including weekends. Passport Applicant will need to visit Passport Seva Kendra on the given date of appointment for application submission process. These services will be first launched in pilot mode at 15 select CSC locations in Uttar Pradesh and Jharkhand from next. The full roll out across the country is expected to conclude by end of March 2014.